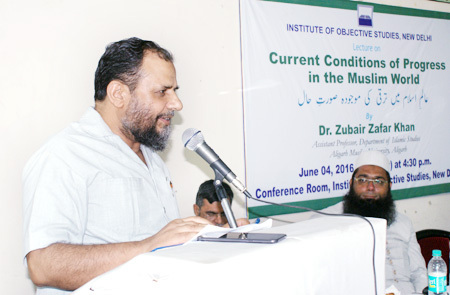 The Institute of Objective Studies organised a lecture on “Current Conditions of Progress in the Muslim World” at its conference hall on June 4, 2016. 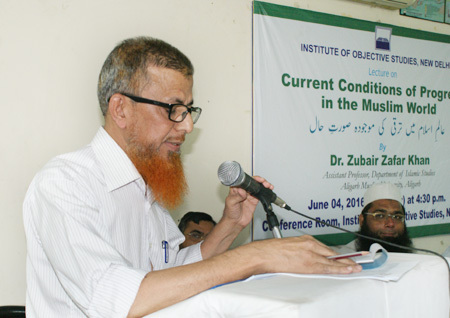 Dr. Zubair Zafar Khan, Asstt. Prof., Deptt. 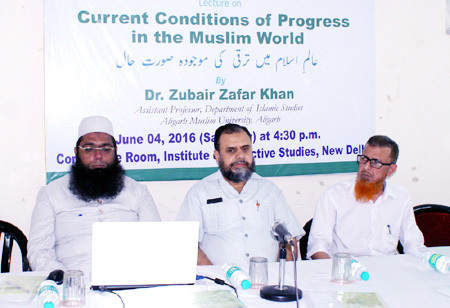 of Islamic Studies, AMU, who delivered the lecture, dwelt at length on the present state of progress in the Muslim world in the field of education, technology, economy, research and innovation, space science, media, sports, etc. He pointed to certain amazing facts about the standard of development in the Muslim majority countries in comparison to some leading nations of the world. Commenting on the total world population of about 7.068 billion, he said that Christians accounted for 33.39 percent followed by the Muslims who were 22.74 percent. While Hindus constituted 13.8 percent, Buddhists accounted for 6.77 percent, Sikhs 0.35 percent, Jews 0.22 percent, Bahais 0.11 percent and the followers of other religions constituted 10.95 percent. This also included the figure of non-religious people and atheists who accounted for 9.66 percent and 2.01 percent respectively. He held that the Muslim population was 1.65 billion and the Jewish population stood at 14 million Muslims were 117 times the Jews. Dr. Khan noted that almost three-quarters of the words’ 775 million illiterate adults were found only in ten countries–India, China, Pakistan, Bangladesh, Nigeria, Ethiopia, Egypt, Brazil, Indonesia and Congo. Out of these ten, six were Muslim majority countries. Referring to the number of universities, he said that the Muslim countries were far behind in higher education as the United States of America alone accounted for more universities compared to their number put together in Indonesia, Turkey, Morocco and Iran. The number of the universities in the Muslim world remained at 2621. Similarly, the number of researchers per million in the Muslim countries was not encouraging. While Tunisia and Malaysia accounted for 1,837 and 1,643 researchers per million respectively, Japan and the USA had 5,158 and 3,979 researchers per million respectively. He held that the average number of researchers per million in Muslim majority countries was 193 against 1,020 in China. The number of Ph.Ds produced by the Muslim countries was much below the number in the developed and developing countries like, China, USA, India and Finland. While China and USA produce 48,987 and 48, 069 Ph.Ds per year, the entire Muslim world could produce a meager 5,933. 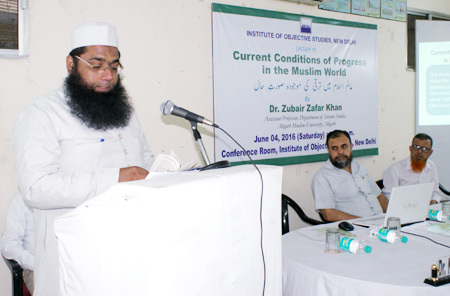 Dr. Khan observed that Muslim countries also lagged behind in the collection of books in their libraries. The National Library of Malaysia had 1,300,000 volumes followed by King Saud University libraries in Saudi Arabia with 1,100,000 volumes, Taksim Ataturk Library in Turkey with 600,000 volumes and Punjab University Library in Pakistan with 500,000 volumes. On the other hand, the Library of Congress in the USA had 34,528,818 volumes followed by the National Library of China with 28,980,777 volumes, National Library of Canada with 26,006,054 volumes, Russian State Library with 17,000,000 volumes, and British Library with 15,500,000 volumes. He said that so far as the number of Nobel Prize won by the followers of different religions was concerned, Muslims won only 13 Nobel prizes since 1901 as against 423 won by the Christians and 193 by the Jews. The Harvard University produced 150 Nobel Laureates, the Cambridge University produced 91, MIT 84, and Oxford University 27. Commenting on export, Dr Khan said that the sum total of the exports of all the Muslim majority countries was 2.195 trillion dollars in 2012 while China alone exported goods worth 2.021 trillion dollars and USA recorded 1.612 trillion dollars worth of exports. He noted while 60 percent Christians were involved in industrial production, hardly 16 percent Muslims were engaged in such activities. Similarly, he said, employment conditions in some Muslim countries were worse. While 77 percent population of Burkina Fasso was unemployed, 60 percent in Turkmenistan, 59 percent in Djibouti, 48 percent in Senegal, 45 percent in Kosovo and 35 percent in Yemen were jobless. Referring to poverty among various countries, he said that 80 percent population of Chad was living below poverty line. Similarly, 70.2 percent population of Sierra Leone was living below the poverty line with Nigeria and Comoros accounting for 70 percent and 60 percent respectively. Referring to the number of newspapers published in the Muslim countries, he said that Turkey accounted for the largest number of newspapers among the Muslim-majority countries. While the United Kingdom had 652 local newspapers USA and Turkey accounted for 9,712 and 91 newspapers respectively. He said that till date 27 Muslim countries had won 118 gold medals collectively in Olympics, whereas USA alone won 1,063 gold medals. The USSR, UK, Germany, Italy and France won 473, 245, 244, 235 and 229 gold medals respectively. Dr. Khan pointed out that there were several sectors, including computer manufacturing, computer software and programming and aircraft engineering, in which Muslims had no representation. He said that there were some other areas where Muslim representation left much to be desired. Manager (Research), IOS Data Bank and formerly associated with NCAER, M.M. Khan highlighted the activities of the IOS data bank and informed that it could boast of possessing valuable data relating to different subjects. He said that a cursory look at the statistics indicated the Muslims were lagging in almost all fields of activity. In his presidential speech, Asstt. Secretary General, IOS Prof. M. Afzal Wani held the topic for the discussion was consciously selected in order to know where we stood today in terms of achievements in different fields vis-à-vis the world. He said that the IOS would continue to organise such programmes in future as well. The lecture began with the recitation of a verse from the holy Quran by Hafiz Athar Husain Nadvi. Dr. Nakhat Husain Nadvi compered the proceedings. 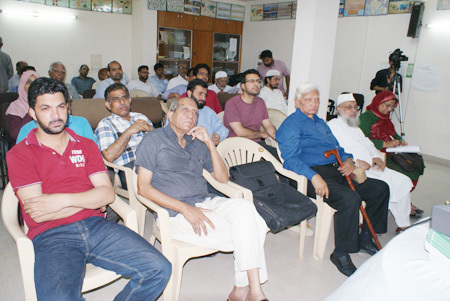 The lecture was attended by a good number of scholars, students, social activists and prominent citizens, including Yasir Basher, Md. Ehtisham, Col. AR Khan, VSM, Prof. Shafiq Ahmad Khan Nadvi, Prof. Hasina Hashiya, Moidul Islam, Mumtaz Ahmed, M. Aquil Khan, Chaudhary Nasir Ahmed, Javed Hasan, Md. Shoeb, Abdul Haq Falahi, Imtiyaz Ahmed Qasmi, Shamsuddin, and Tanvir Alam.